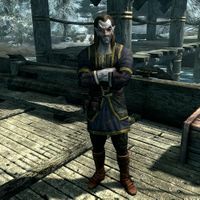 Ravam Verethi is a Dunmer rogue living aboard The Sea Squall in Dawnstar. Though he works for Captain Wayfinder, he is less than pleased with the hierarchy and rightfully calls the captain a boy. With the ship permanently docked, Ravam spends all of his time on deck, dividing his time between wandering, sweeping, eating or drinking, at times seated on one of the three chairs. He never sleeps. He wears a set of merchant clothing and a pair of boots. He carries a random selection of common items and gold. When approached, he will openly nag about his life and the inexperienced captain, saying, "I don't like taking orders from a boy, but I need the gold." and "Not a day goes by that I don't think about finding a new ship. I guess it's easier just to stay put." He even considers taking drastic measures to get rid of Wayfinder: "I could run this ship better than that boy who calls himself a captain. Maybe one day I'll do something about it." and "The captain inherited the Sea Squall from his mother when she died. Maybe I can inherit the ship if he dies..."
Even if Wayfinder dies, Ravam will continue to talk as if he were alive. This page was last modified on 4 April 2015, at 14:03.